"African American history", "Barack Obama", "Black History Month", "Frederick Douglass", "Jourdan Anderson", "P.H. Anderson", "Ron Paul", "Slavery", "Taylan Gibson", "Teaching", "civil rights", "racism"
Sir: I got your letter, and was glad to find that you had not forgotten Jourdon, and that you wanted me to come back and live with you again, promising to do better for me than anybody else can. I have often felt uneasy about you. I thought the Yankees would have hung you long before this, for harboring Rebs they found at your house. I suppose they never heard about your going to Colonel Martin’s to kill the Union soldier that was left by his company in their stable. Although you shot at me twice before I left you, I did not want to hear of your being hurt, and am glad you are still living. Slavery is the ugliest chapter of American History and to this day it makes many white people very uncomfortable to talk about it. In fact, I would go a little further to make the claim that a lot of today's Ron Paul supporting types of youth don't have a clue about slavery because if they did, I am sure they would not support bigotry and racism displayed by Ron Paul but again there are some who do support the view that Blacks, Indians, Asians, Hispanics or Gays should not be served at restaurants if the owner of a restaurant chooses to not serve them in the name of free speech. 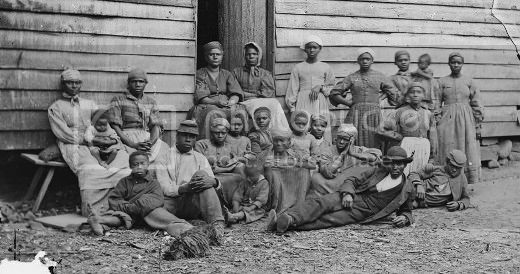 Who knows, some may believe in the view that the South was right in the Civil War and that the "North should have paid to buy slaves from southern slave owners to avoid the war" in the process denying Blacks equal opportunity. Well, for those with limitation, if you don't learn, you will never know the monstrous crime that was committed and the ideology some are pushing today in our politics makes you criminal to say the least. I sometime feel like there is a systemic effort to bury the history of slavery and its effect in today's Black America under the rug and pretend like it never existed despite the facts that the cycle of on-going privilege is the roots of all evil. So how can we bring black history, the effect of slavery and the struggle to abolish it, into the classroom? Shouldn't we have a well designed, mandatory curriculum just like other American history that are mandatory teachings about the crimes committed against Black America so that there is awareness as to the continues frustration and stronghold its effect still has in our society? America is so illiterate on the subject but we must find, as President Obama said, "a way that connects the past cruelty to current events" because "the capacity for cruelty still exists." And when we try to connect the past cruelty to current events, it does not mean we have to be ignorant like some teachers who lack the sensitivity the topic requires. Take for example the recent controversy that obviously lacked sensitivity or, who knows, it may be a clear display of intentional racism towards black students at Strong Middle School, in Detroit. 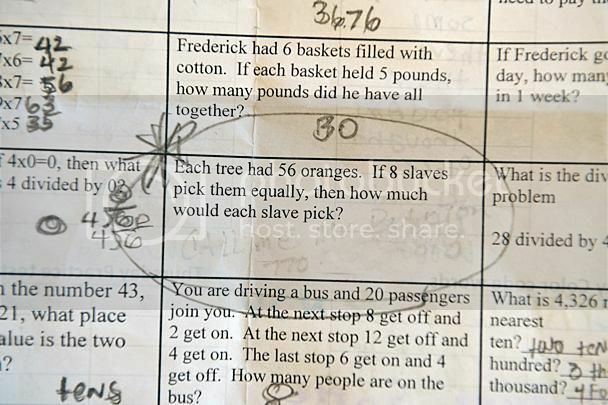 A teacher gives an assignment, which read: "Pretend that you are a slave in the southern United States. Write a journal/diary memoir about your life." "She wanted you to write a journal about your master, what he looked like and how would you escape if you were a slave," Taylan Gibson explained. How Taylan says this homework assignment made him feel was enough to break his mother's heart. "Made me embarrassed to be black," he told us. Could there have been a better way to teach the suffering of black people without having an 11-year-old re-live it or be ashamed of who he is? I am not going to address whether the teacher is just simply ignorant or racists because I can't see the person's day to day life style and what they stand for but I would say she is one dumb stupid individual. I sometimes wonder if teachers who try to teach sensitive subject like slavery or the Holocaust had any training in their early childhood education to know what is and is not offensive. 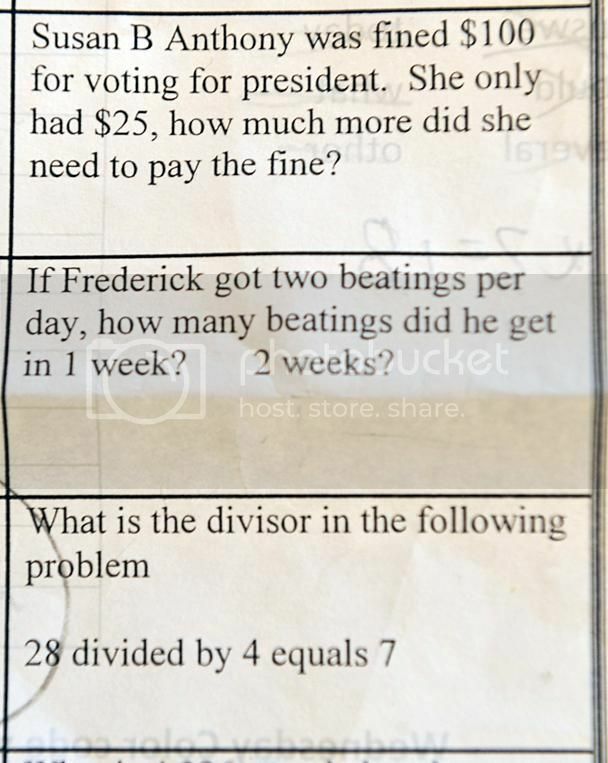 Another example from last months was in Norcross, Ga., where a teacher at Beaver Ridge Elementary School gave a slavery-themed math assignment to her students using slave beatings and picking cotton to link a history lesson about Frederick Douglass to teach a math concept which I find extremely offensive and racist. Frederick Douglass is my hero and if anyone need to teach about him they better tell the whole truth and nothing but the truth about this heroic man. I have a niece who is a junior in high school and she wouldn't be able to tell you a lot about what she knows about slavery from her history teachers in our public schools because it is rare to discuss the crime and suffering White America has inflicted upon Blacks in this country and its trickled down effect even today. I think that understanding the history of the Confederacy and understanding the history of the Civil War is something that every American and every young American should be a part of. ..."I think it's just a reminder that when we talk about issues like slavery, that are so fraught with pain and emotion, that, you know, we better do so thinking through how this is going to affect a lot of people and their sense of whether they're part of a commonwealth or part of our broader society. Well, I am part of Americans broader society who embraces Black History Month! How about you?